Police investigating the discovery of a baby girl abandoned in a Birmingham park are working through a list of more than 100 women they have been told could be the mother. Baby Jade was found by a dog in Stechford Park on 31 October. Officers said the list of names had been compiled from tip-offs after appeals for information. They have also revealed they are carrying out DNA and forensic tests in a bid to solve the mystery. Jade is now in foster care after being treated in hospital. Making a fresh appeal for information, Insp Richard Cox said: "Baby Jade is continuing to do well - she has now left hospital and has been placed into foster care. "I also want to appeal once again directly to Jade's mum to come forward and get in touch." Jade, named after the dog who found her, was believed to have been left in the park for about 30 minutes before she was discovered. 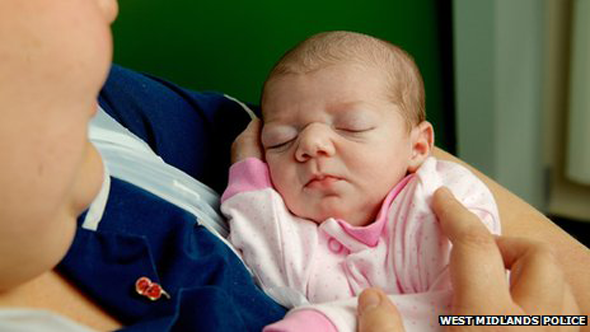 Wrapped in a towel in a carrier bag, she weighed 6lbs (2.7kg) and was understood to be only one day old.